SUNDERLAND, United Kingdom, Jan 2, 2017 (AFP) – Liverpool manager Jurgen Klopp was an angry man after two penalties from Jermain Defoe slowed his team’s pursuit of the Premier League leaders Chelsea as they were held to a 2-2 at lowly Sunderland on Monday. Liverpool led twice through goals from Daniel Sturridge and Sadio Mane, but two disputed decisions by the referee, Anthony Taylor, enabled Sunderland to emerge with a point and prompted Klopp to confront him on the pitch after the final whistle. Liverpool are five points adrift of Chelsea, who could extend their lead to eight points if they beat Spurs on Wednesday. This was Mane’s final game for Liverpool before he departs to play for Senegal in the African Cup of Nations—and it was incident-packed farewell as he conceded one of the penalties after scoring his goal. Klopp’s frustration was fuelled by the fact that Liverpool looked to be heading for a routine win when they went ahead through a goal that exposed the uncertainty that has dogged Sunderland’s defence throughout the season. 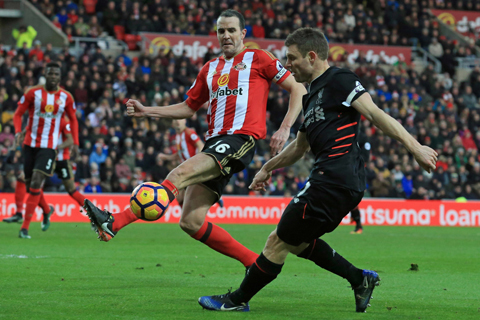 Sunderland granted Dejan Lovren too much space on the edge of the area at a corner and he hooked in a shot that bounced into the ground before Sturridge diverted it past Vito Mannone from close range. Mannone, back in the side because of an injury to Jordan Pickford had been shaky and at fault for at least one goal in a 4-1 defeat at Burnley in their previous game. But he pulled off two excellent saves in quick succession in the eighth minute to deny Sturridge and Georginio Wijnaldum goals and Sturridge was frustrated again in the 18th minute. Sunderland had not been totally inactive, however, and their former keeper Simon Mignolet went down well to deal with a shot from Jack Rodwell in the 13th minute. But they had been second-best until they managed to break Liverpool’s stranglehold on the game and equalise in the 25th minute with their first controversial goal. There certainly appeared to be little contact when Didier Ndong tried to find a way between Wijnaldum and Ragnar Klavan, but Taylor awarded a penalty when he went down. Defoe scored from the spot for his 10th goal of the season and almost added a second two minutes later when Adnan Januzaj’s well-judged ball sent him clear. Mignolet did well, though, to get a hand to the ball as Defoe tried to round him and was fortunate when Fabio Borini’s shot from the loose ball was deflected wide. Liverpool’s early authority had now vanished and Rodwell, who has never tasted victory after starting 33 games for Sunderland, forced a good save from Mignolet from outside the area. But Sturridge remained a formidable threat and Mannone had to be alert to save twice from the England international before the interval. There was further encouragement for Sunderland when they continued to match Liverpool after the restart and had powerful claims for a penalty rejected by the referee when Emre Can appeared to handle a cross from Januzaj. Liverpool thought they had secured a vital victory 18 minutes from time with another goal that tested the officials. Mane was marginally offside when a corner was diverted to him in front of goal, but Taylor and his assistant decided the ball had reached him via the head of Sunderland’s Papy Djilobodji. But there was to be one more contentious moment in the 84th minute when Mane stretched out an arm to block Sebastian Larsson’s free-kick. Taylor pointed to the spot—with some justification on this occasion—and Defoe beat Mignolet again.